In a large food processor or blender, combine whole tomatoes, tomatoes with chilies, onion, jalapeño, garlic, sugar, salt, cumin, lime juice, and coriander. Pulse until you get the salsa to the consistency you’d like. Taste and adjust seasonings, if necessary. 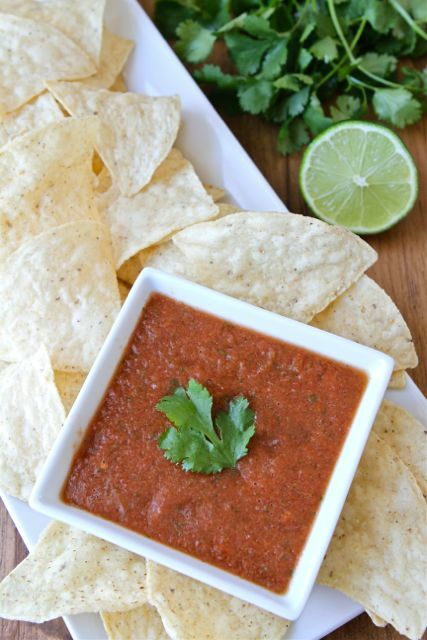 Refrigerate salsa for at least an hour. You can eat this with tortilla style chips, or throw it over some nachos. We recently added it to delicious Mexican tortillas – with homemade spiced mince, tomatoes, lettuce, guacamole, cheese, sour cream and coriander. Yummmmm!!! You can add it to your burger or on your homemade pizza or on some crackers with cheese. It’s also a great Christmas gift if you’re doing the homemade Christmas gift thing. Yum. It is also paleo approved (if using no sugar). I can eat this with a spoon, it’s that good.